Description: Tufted rhizomatous perennial to 0.7 m high; sheaths tightly enclosing culm, becoming loose with age. Leaves with sheath ribbed, glabrous; ligule a densely ciliate rim with hairs c. 0.25 mm long; blade flat or inrolled, to 3 mm wide, ribbed, glabrous, margins scabrous. Inflorescence open, 6–15 cm long, to 3.5 cm wide; rachis ribbed, glabrous, sometimes scabrous. Spikelets 10–24 mm long, to 7 mm wide, florets 3–10; pedicels 10–40 mm long, minutely scabrous. 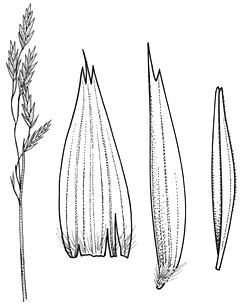 Glumes unequal, 2-toothed, 3-nerved, glabrous, awnless; lower 4.5–6 mm long, upper 5.5–8 mm long. Lemmas 6–9 mm long, 3-toothed, lateral teeth often shorter than the central tooth, 7-nerved, glabrous; callus bearded with hairs 0.5–1 mm long. Palea as long as lemma, 2-toothed, 2-nerved, 2-keeled, keels scabrous, glabrous. Distribution and occurrence: Grows in moist shady areas of the Blue Mtns district.